Zest when you think you’ve seen it all….. Recipes are wonderful, but they never tell you how many lemons you are going to need. This recipe calls for 6 tablespoons of lemon juice, divided. How much juice you get from a lemon depends on several things. When you are looking at lemons, pick them up. You want to buy a heavy lemon. The heaviness means there’s more juice. So, for this recipe I bought 6 lemons and used about 4. I would rather have too many lemons, than to run out and buy more. Make sure the lemons are room temperature. You will get more juice out of a lemon that is NOT cold. Roll the lemon on the counter before you juice the lemon. Also, juice the lemons before you start the recipe. I use a wooden reamer, and juice the lemons over a glass-measuring cup. You can just use your hands to squeeze them. Remove the seeds with a spoon. Before you juice the lemons, I would zest them into a separate container from the juice. 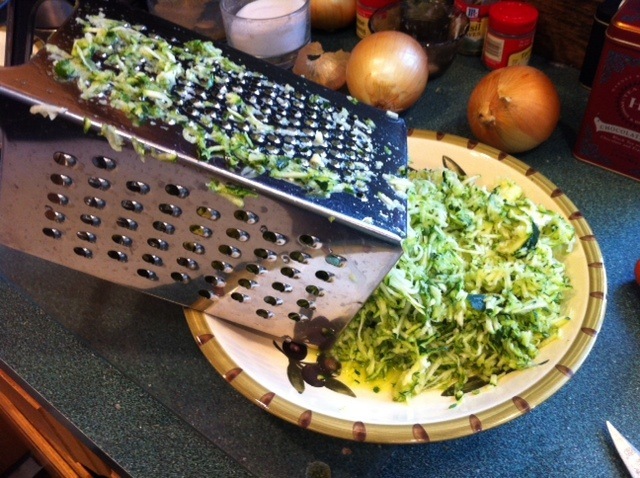 You can use a zester or a box grater that has a zesting side. Now you are ready to get baking. Combine the flour, baking powder, and salt into a medium bowl. Set aside. In a large bowl, combine the butter and sugar. You use unsalted butter in baking for freshness. Salt is a preservative and gives butter a long shelf life. Therefore, unsalted butter is fresher. Using an electric mixer beat the butter and sugar until it’s light and fluffy. This takes about 3 minutes. Add 1 egg at a time. I recommend breaking the eggs into bowl, just in case they have gone bad. Beat the mixture until the eggs are incorporated. Add the ricotta, lemon juice, and lemon zest. Beat to combine. Stir in the dry mixture of flour, baking powder and salt. Line 2 baking sheets with parchment paper. Spoon the dough onto the baking sheet, using about 2 tbsp. of batter for each cookie. You can place 4 across the pan, as the dough does not spread out. Bake each sheet for 15 minutes until slightly golden at the edge. I like to bake each sheet one at a time. That’s my preference in my oven. Remove the cookie sheets from oven and let cookies rest on the baking sheet for 20 minutes to cool. To make the glaze, combine the powdered sugar, lemon juice and lemon zest in a small bowl. Use ½ tsp. of glaze on each cookie, using the back of a spoon to spread. Let the glaze harden for 2 hours. Store in an airtight container. If you want to go over the top with these cookies, you could put a few candied lemon peels on before the glaze hardens. Enjoy! In case you hadn’t noticed, I make a lot of soup. Soup is good. Most of my soups are tomato based and often include lentils, spinach, different spices and some kind of sausage. I’ve been looking to make something different and healthier. I have read various recipes that used roasted cauliflower, but they relied on too many spices. I found one recipe that used roasted cauliflower and roasted parsnips. Pure magic. I adapted the recipe so that the sweetness of the parsnips would be the dominant flavor. Instead of roasting the spices with the vegetables, I added them later into the chicken stock. Instead of roasting the onions, I sautéed them in olive oil. My new friend, the Immersion Blender, made sure the soup was creamy. Put the cauliflower and parsnips in a bowl and coat with olive oil. Sprinkle salt and pepper onto the vegetables. Place the vegetables onto a cookie sheet and roast for 30 minutes. Every 10 minutes stir the vegetables so they don’t burn. You want them to have some color and soften. While the vegetables are roasting, heat a large pan and cover the bottom with olive oil. Sauté the onions until they are translucent. You don’t want to caramelize the onions, just soften. Pour in chicken stock. Add spices and bring to a simmer. After the cauliflower and parsnips are roasted, place them into chicken stock and simmer for 15 minutes. Shut off the burner, remove the bay leaves and place your immersion blender directly in the pan. Puree this mixture until creamy. If you don’t have an immersion blender you can do this is in a blender. I would do it in several small batches being careful with the hot liquids. Bring the soup to a simmer and add the bay leaves back in. Once it simmers, add the half n half. If you don’t want to use dairy, you can add water or more chicken stock. You can make the soup as thick as you’d like. Stir the soup, shut off the heat and put the lid back on the pan. Let the soup sit for 5 minutes. This soup took under an hour to make. I was in a race with time as hubby needed to be on a conference call at 10am. That Immersion Blender would have interfered with his training. I was done minutes before his call. Are you as tired as me of this green Le Creuset? If anyone’s interested I would like a dark blue oval one. Just sayin’…..
I’m sorry, did I just put you to sleep. Well WAKE UP. Braised chicken is one of life’s delicacies. It’s simple and full of flavor. The best part of this dish is you make it ahead. Make a lot. You won’t be sorry. Now I like to think that the onions are the stars of this dish. I sauté the onions in olive oil and a sprinkling of salt. If you have the time to caramelize the onions, please do. They add a deep flavor to the dish. 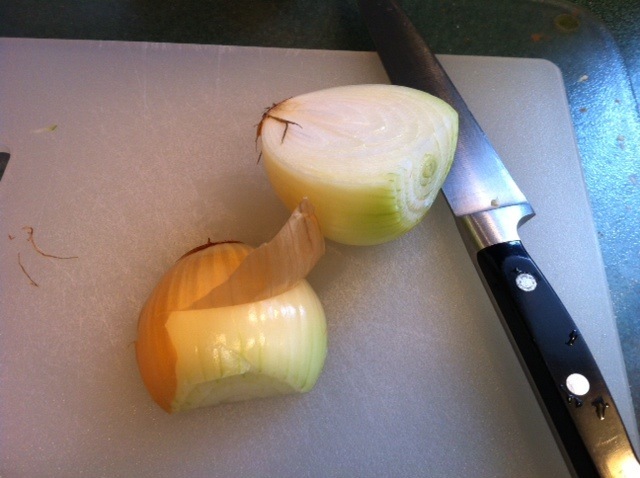 To caramelize onions, you cook them on a medium low heat and stir….for a long time. You don’t want them to burn, but caramelize and become sweeter. I prefer to let them cook down to almost a relish. If you don’t want to spend the time caramelizing them, that’s okay. Just cook them until they are translucent. To braise you must have a liquid. I use some water with a bouillon cube or a product called “Better than Bouillon”. You can use chicken broth too. I also add some white wine first to deglaze the onions. This means you scrape up the yummy brown bits from the pan, and let the wine evaporate. All the flavor is right there. So let’s talk recipe. I don’t have one. Oops. I just always wing it. It’s really just browning, sautéing and braising. Easy peasy. This is something that I have made forever. There are some components and methods that we need to discuss. First, the chicken. I like to use 4 leg quarters. You don’t have to, but please use chicken on a bone. Chicken cooked on the bone will stay moist. Make enough for two meals. This dish does take time, so make it worth it. You also need a pan with a lid. When you braise, you cover the pan to keep the liquids from evaporating. I use a large fry pan that isn’t too deep. Tonight I used four leg quarters and two VERY large onions. I don’t think you can have enough onions in this dish. You cook them down over a period of time. Since they are the star, I cut them in half moons. First you cut the tip of the onion off. Then cut the onion from the root down to where the tip was. Peel the skin from each half and cut thin semi circles of onion, with the flat side down on the cutting board. Always do this before you even take out the pan. Put the onions in the bowl. It makes cooking so much easier when you are prepared. So, the first step is to heat your pan over a medium high heat. Pour some olive oil on the bottom of the pan and let it heat. Put the chicken skin side down in the pan. Let the chicken brown for about 5 minutes. If you try to lift the chicken and the skin sticks to the pan, let it keep cooking. At this point we are only browning the meat. In a while, we will cook the meat through. What ever sticks to the pan is full of flavor and will help made the sauce very tasty. After about 10 minutes, flip chicken. If the skin is still sticking, don’t worry. The world will not end. I like to sprinkle Lawry’s seasoned salt at this point on the chicken. Let the chicken cook for about 5 more minutes. Remove chicken from pan. I like to set it on a cookie sheet while I sauté the onions. Now, I drain off any fat from the pan. Don’t scrape the pan bottom. 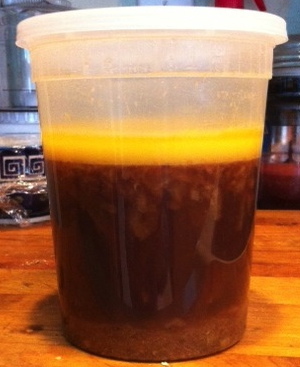 Just pour the fat into a Pyrex measuring cup, or even a coffee cup. My “friend” poured the very hot fat into a glass once. Nothing like shattered glass and boiling hot grease on your kitchen counter. Said no one. Ever. Set it aside to cool. You will throw this out later. I let it cool on the counter and then put it in the fridge. It hardens and gets tossed into the trash. Someday I’ll tell you how I learned that sugar burns blue. Right honey? Put the pan back on the burner and add more olive oil to the pan. Time to sauté the onions. We talked about this already. Don’t wander away from them. Keep a watchful eye on the onions. 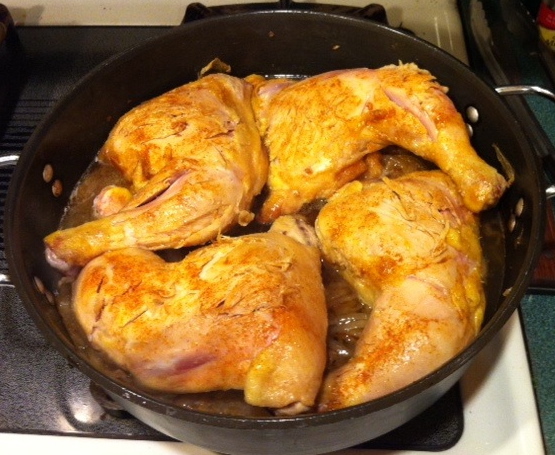 When they are brown enough for you, add the chicken back into the pan. If you listen, you will hear angels singing. Really. I add broth/water half way up the chicken. You want to braise it, not drown it. I also add the bouillon now. Put the cover on the pan, lower the heat, and let it simmer for about an hour. See why I said to make enough for more than one meal? This takes time, but it’s very worth it. The chicken is done when it is falling off the bone. I take the chicken and put it on a CLEAN cookie sheet to cool. I spoon out the onions, with a slotted spoon, into a bowl. Let the sauce cool in the pan. Once the chicken is cool enough to handle, I pull the meat off the bones and put it in a container, with the onions. This is easier to reheat and serve when you shred the meat off the bone. There’s more portion control too. I certainly don’t want a hunk of meat that Fred Flintstone could eat. Yabba dabba do. Being frugal, I put those bones go right into the freezer for future chicken stock. I pour the sauce into a separate container. The fat will rise as it cools. By dinnertime tomorrow, it will have risen to the top and you can throw out the fat by scraping it up with a spoon. That’s it. The next day when you’re ready for dinner put the meat, onions and sauce in a pan and heat on low. Add salt and pepper to taste. Serve with rice or noodles. A simple vegetable like steamed broccoli pairs well with this dish. Ha! I said “pairs”. 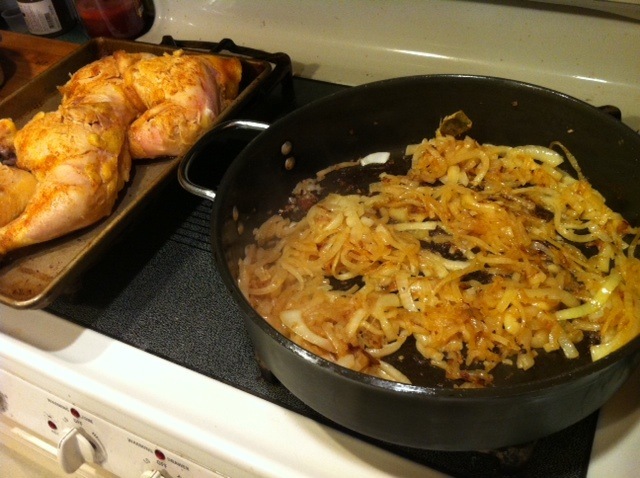 I made this chicken tonight, while I was cleaning up after dinner, which I made Saturday. That’s how I roll. I like to cook ahead and serve another day. Flavors meld together and taste even better. That’s the beauty of braising. Try it. You’ll like it! Winner, winner; chicken dinner! Breadsticks and Soup for you! It’s snowing again today. It’s beautiful. Until it turns brown. 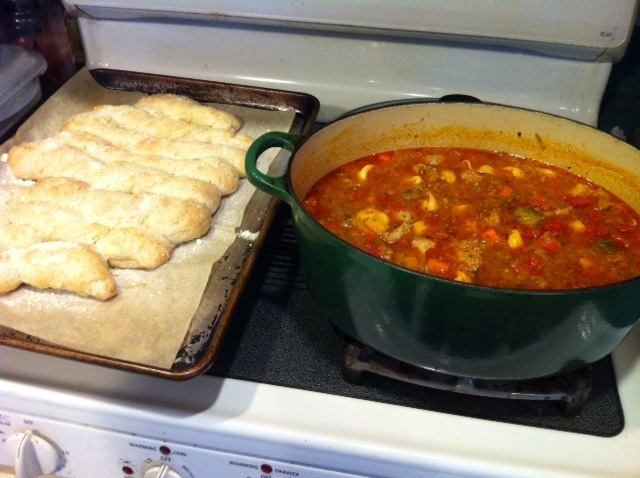 So today, before the boy went to work, I made some breadsticks and tortellini sausage soup. It hit the spot. There is nothing like the smell of bread baking on a cold winter’s day. The breadstick and soup recipes are from OUR BEST BITES (www.ourbestbites.com). They are simple and delicious. If you are going to make both, start the bread dough first. It has to rise for 45 minutes. The soup is wonderful and I have made a few changes that add a little richness to it. Please make this soup. Now. Tomorrow. Soon. It’s wonderful. I love to bring it to work for my lunch. I zap it in the microwave and I am brought immediately to a happy place. Don’t look at me. If you’ve never worked with yeast, this is the perfect recipe to start. It’s simple and requires very little attention. In a large bowl, combine 1 ½ cups of flour, sugar, yeast, and salt. Pour in the water. If you’re not sure about the temperature of the water, pour cool water into the measuring cup and let it sit for 15 minutes. Cool is better than hot. Hot water will kill the yeast and the bread won’t rise. Cool water will just make the dough take longer to rise. No big deal. Stir the mixture. Gradually add more flour until the dough starts to pull away from the sides of the bowl and it barely sticks to your finger. Add 1 cup at a time. I usually use almost 4 cups. It depends on whether it’s a humid summer’s day or a dry winter’s day. So add and stir. Spray a glass or metal bowl with cooking spray and place dough in the bowl. Cover with plastic wrap and allow it to rise for 45 minutes or until doubled in bulk. Remove the dough from the bowl and place on a floured surface. I like to use parchment paper. I roll out the dough on it and bake the dough on it. Roll the dough in a rectangle and cut into 12 strips with a pizza cutter or knife. Roll each piece of dough into a snake and then drape it over your forefinger and twist the dough. Place on baking sheet and repeat with remaining dough. Don’t worry if they touch. Pulling freshly baked dough apart is wonderful! Cover with towel and let rise for 30 minutes. They get all chubby on you! When there’s about 15 minutes to go, preheat your oven to 425 degrees. Bake for 10-12 minutes or until golden brown. Rub some butter on top of the breadsticks by grabbing a stick of butter with the wrapper on, and run up and down the breadsticks. Ohhhh bread and butter. Sprinkle breadsticks with garlic seasoning or powdery Parmesan cheese in a can (really) and garlic salt. Enjoy! This dough is also perfect for pizza. Follow the directions until the forming of the breadsticks. Instead, I stretch the dough onto a cookie sheet that has olive oil spread on it and cornmeal. That’s how I make my pizza. I have made this soup many times. My family likes it. It makes a great meal on winter’s night and many leftovers. The recipe is not complicated, but it takes many, simple steps. As always, read the recipe thoroughly before making it. I strongly suggest that you prep all the veggies and have all the liquids and spices on hand. Being prepared makes cooking easier and more enjoyable. Trust me on this. Heat pan on a medium heat and add enough olive oil to lightly coat bottom of pan. Add onions and begin to sauté them until translucent. Add the sausage that has been removed from the casing. Break it into pieces. You can further chop the sausage, as it cooks, so don’t worry. Let the sausage cook and brown slightly. Add in garlic and cook for 30 seconds. Add the tomatoes, tomato sauce, tomato paste, juice, water, broth, carrots, oregano, and basil. Cover and simmer for ½ hour. I like to add tomato paste. The original recipe doesn’t call for it, but I like the flavor it adds. I try and freeze any Parmesan rinds I have. They are a great addition to a soup like this one. The rind gives it a little creaminess. Add the frozen tortellini and cook for about 10 minutes. Serve this with bread or breadsticks and freshly grated Parmesan on top. I hope this feeds your soul too! Let’s talk about cutting onions. I cut a lot of onions. A lot. So I would like to take a minute and show you how I cut them. Dice them to be more precise. 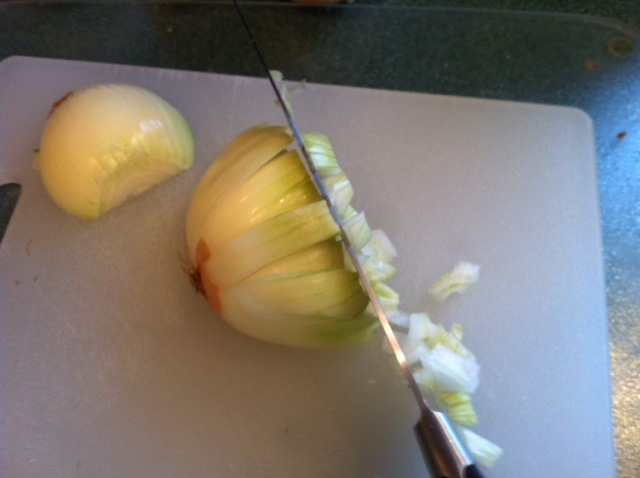 First, I like to trim the tip of the onion off, and then cut from the root end to where the tip was. This make is it much easier to remove the skins. Once you remove the skins, you are ready to dice. 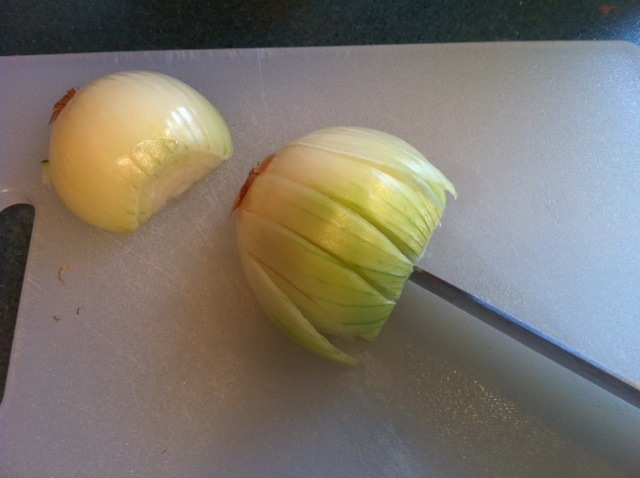 I like to turn the onion onto the flat side, and make slices from almost the root to the end of the onion. 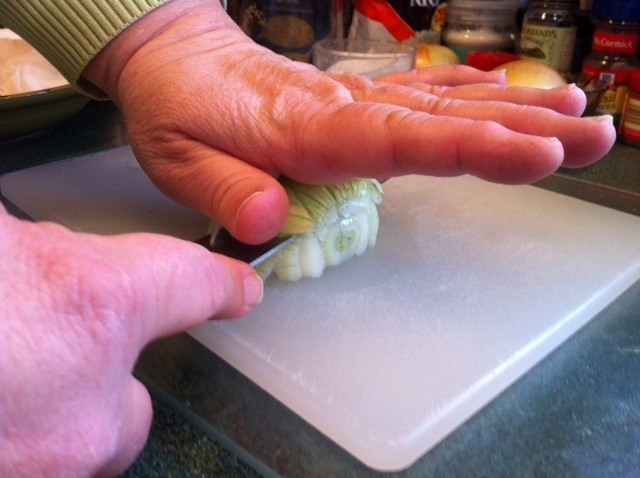 Now I place my palm on the onion and press down, while I cut horizontally towards the root of the onion. I don’t cut all the way to the root, but as close as you can. 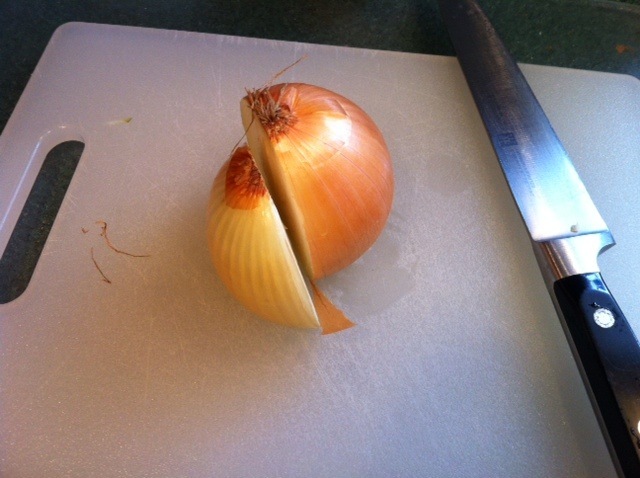 Depending on the size of the onion, you can make one or two horizontal cuts. Please excuse my peasant hands. Hey, they work just fine. Sorta. Now you are ready to dice the onion. It’s that simple. I suggest trying if first on a large onion. This is a great technique that saves you time when prepping for cooking. I hope you try this method. Suzanne and I were blissful newlyweds when she introduced me to homemade clam chowder. It was an AH HAH moment for me, much like buying blueberries, but opposite? YOU CAN MAKE CLAM CHOWDER? What?? My mother usually made fish chowder and I firmly believed there should be no risk of bones in any chowder. This experience was life changing! Okay, humor me, it was a wonderful experience! Making your own clam chowder is super easy and tastes so much better than any chowder from a can. You can adapt this recipe, as you like. You like more clams than potatoes? Add more clams, reduce potatoes. Too creamy? Add less half and half and more milk. It’s that simple. Soup is not a science. It’s an opportunity to create a taste experience that is yours. Here’s the best hint when you cook….you can add, but you cannot take away! As always, please read any recipe thoroughly before attempting. I like to give the original recipe with changes and suggestions in the body of the text. Boiled potatoes. Let me give you my secret way to boil potatoes for this chowder and my potato salad recipe: boil them with their skins on. Really. Put the potatoes in a pan, cover with water, and boil for about 30 minutes. They should be fork tender with skins pulling away. Take them out of the water and let them cool on a plate. After the potatoes have cooled, the skins pull right off. 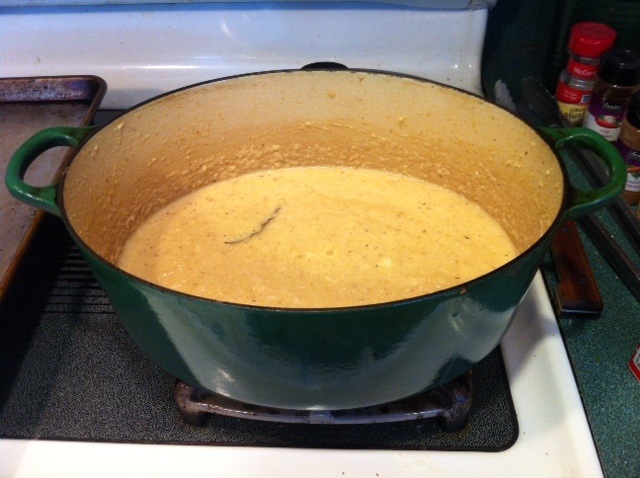 This method keeps the potato firm and prevents them from getting mushy in the chowder. It takes a little longer than peeling and boiling potatoes but it makes the world of difference. When they are cooled and peeled, cut them into small pieces. Remember, they must fit on a soupspoon! You can even cook the potatoes a day ahead and then refrigerate them. This is the most time consuming part of the recipe. You’re almost there! In a 4-quart pan, sauté diced onion. I like onions. The original recipe called for a medium onion. I would say more like 2 medium or one large onion makes this chowder. I suggest dicing the onion and putting it in a bowl, then heat the pan. You don’t want to burn or brown the onions. Put the butter in the pan and on a medium heat, sweat those onions. If need be, lower the heat. To help them sweat, sprinkle some salt on them, this helps draw the water out the onion. If the pan is looking a little dry, add a little more butter. It’s okay! You want the onion yellow/clear and soft. Don’t forget to stir the onions. Don’t walk away from them! Once the onion is tender, put the canned MINCED clams with their juices, in the onions. I usually put in 4 cans of minced clams and use about 3 large potatoes. You can adjust it accordingly. Put the lid on the pan and simmer the clams for 5 minutes. I hope you’re hungry, because we are almost done. At this point you stir in the half–n-half and milk. Stir the chowder and let it heat on low until it’s warm. Add the diced potatoes and continue to warm. You never want to boil milk or half-n-half. NEVER. Let it just warm through on low heat. I like to let it heat for about 15 minutes. The flavors all blend together. Add salt and pepper to taste. 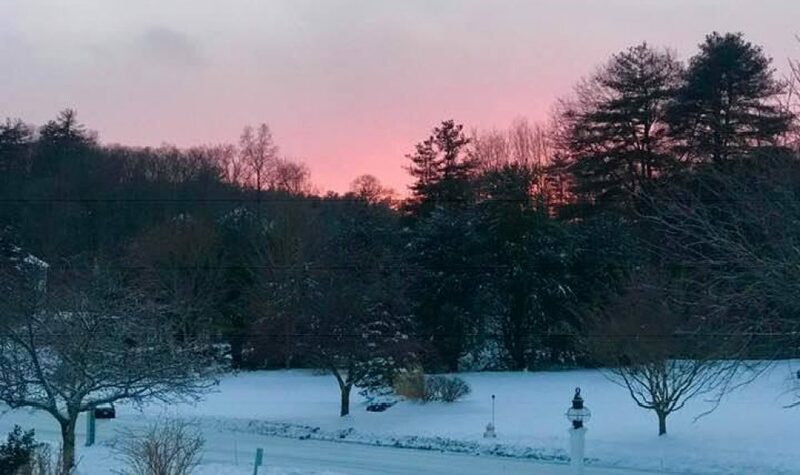 It’s been a cold and snowy winter. As I type, the meteorologist is talking about a new storm tomorrow. There’s a potential of three storms this week. So what does that make me do? Plan my menu! A family’s got to eat right? 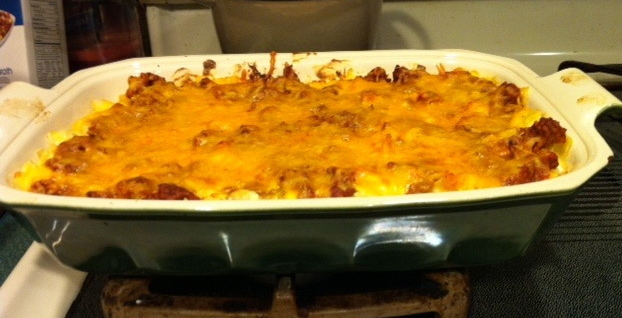 Winter weather makes me want to braise meat, or cook gooey cheesey casseroles. Yes, casseroles. If you consider yourself a food snob, just stop reading this right now. Right now. Stop. I am going to talk about foods that are touching each other and coated in melted cheese. I have a couple of these recipes but today I am going to share one that I have adapted from the Pioneer Woman. Now that woman knows about feeding a crowd! This casserole is made with cottage cheese and egg noodles. I like to use the wide no-yolk egg noodles. The sauce is simple but I’ve added some more flavor with tomato paste and some seasonings and leeks! There isn’t a lot of sauce, so I find these seasonings give it a little burst of flavor. The last time I made this recipe I forgot to buy the green onions. My husband suggested I use the leeks I had. Just heavenly! Allow me to lead you down this path of yumminess…..
Brown the hamburger in a large skillet on a medium heat. Don’t add oil to the pan. Heat the pan for a few minutes before you put the meat in. You can tell the pan is ready when a few drops of water roll into balls and evaporate. I use this trick all the time. As the meat cooks, the fat will come out. I drain it several times while it’s cooking. I use the pan lid and a heat resistant bowl or even a coffee mug to drain off the fat. I put the lid on with a little opening and tilt the pan, pouring off the fat into the bowl/mug. You don’t want this fat in your meal. Yuck. Once the fat is drained, the meat will brown. As the meat is browning, pour in the tomato sauce, salt, tomato paste and other seasonings. 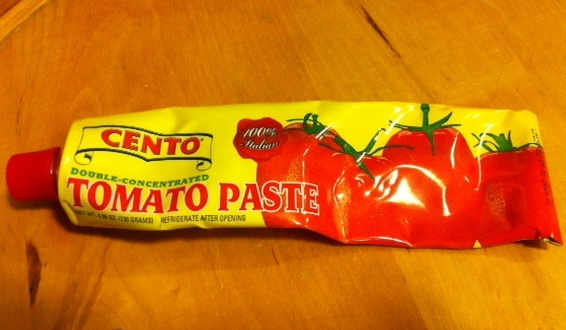 I love to use tomato paste that is in a tube. I put a squirt into my soups that are tomato based. You store the opened tube in the refrigerator. It’s a wonderful addition! Stir all these ingredients, and lower the heat. Put the lid on and let it simmer while you prepare the rest of the ingredients. Cook the egg noodles until a la dente. Don’t be tempted to use the whole package. You only need about ¾ of a 12 oz. package. In this instance, too much is NOT a good thing. Drain the noodles and set aside. In a large bowl, combine the sour cream and cottage cheese. Season with salt and pepper, to taste. Stir in the green onions or leeks into the cheese mixture. When I use the green onions I use about 6 with some of the green part. When I use leeks, I chop them, using some of the green and soak in cold water to remove any sand. The sand drops to the bottom of the bowl, and the leeks float to the top. Add the cooked noodles to the cheese mixture. Stir until noodles are coated. Here is the fun part: the assembly! Add half the noodle mixture to a baking dish. I use a 9 X 13 pan. Top the noodles with half the meat mixture, and then sprinkle on half the grated cheese. Repeat with noodles, meat, then a final layer of cheese. Bake for about 30 minutes, or until the cheese is melted. Let it sit for about 5 minutes Serve this with crusty bread and a salad. Your family will adore you! Enjoy!